Promotional material and media attention for Disney’s upcoming animated series Star Wars: Rebels is continuing in full force. We just got a look at several propaganda style posters promoting the Empire, and now a new character, Kanan, has been revealed along with a video promoting the “cowboy Jedi” which includes interviews and a first look at the character in action. You can check out the video in full below. In the Star War: Rebels universe, Kanan is a Jedi in exile, who escaped the initial slaughter of the Jedi as part of Order 66 in Star Wars: Revenge of the Sith. Kanan has put away his lightsaber under lock and key, and has taken to using a blaster instead as a way to hide his true identity from the Empire and the Inquisitor, another character new to Rebels who has been charged with hunting down the remaining Jedi. If early descriptions of the character are any indication, the show’s producers are definitely gearing up Kanan to be this series’ stand-in for Han Solo. The character will be as quick with his banter as he is with drawing his blaster or wielding his lightsaber. 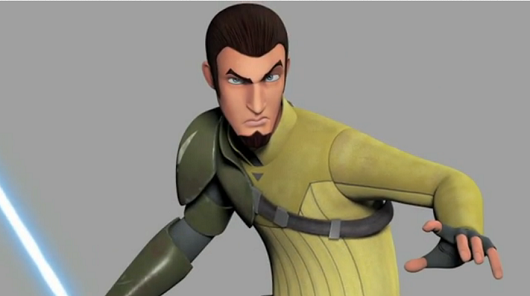 Even Kanan’s design, which includes a low-slung blasterholder, is reminiscent of the rogue scoundrel. As the series progresses, Kanan will have to face who he truly is and once again take up the mantle of a Jedi as he takes up the fight against the Empire. Star Wars: Rebels is currently set to debut on the Disney Channel later this year as a one-hour special, before moving over to Disney XD in a half-hour episode format.